The research indicates that inbound marketing dominated organizations experience a 62% lower cost per lead than outbound marketing dominated organizations. This finding is remarkably consistent from year to year. Previous studies conducted in 2009 and 2010 showed strikingly similar results: the 2009 survey showed that inbound marketing dominated organizations experienced a 61% lower cost per lead; in 2010 the delta was 60%. The gap between spending on inbound v. outbound continues to widen: In 2009, inbound marketing had a 9% greater share of the lead generation budget; in 2011 inbound’s share was 17% greater. Blogs and social media channels are generating real customers: 57% of companies using blogs reported that they acquired customers from leads generated directly from their blog. More and more business are blogging: Businesses are now in the minority if they do not blog. From 2009 to 2011 the percentage of businesses with a blog grew from 48% to 65%. Businesses are increasingly aware their blog is highly valuable: 85% of businesses rated their company blogs as “Useful”, “Important” or “Critical”; a whopping 27% rated their company blog as “Critical” to their business. 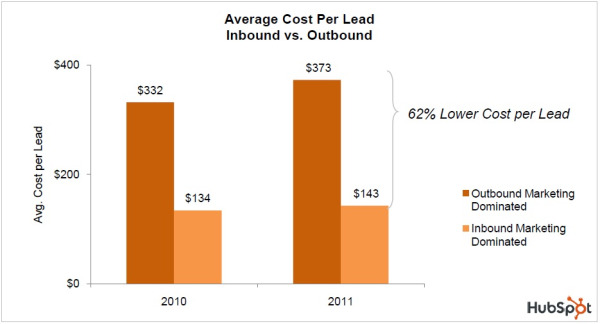 Download the 2011 State of Inbound Marketing report now .